Washington, DC; September 12, 2017 – The Small Press Expo (SPX), the preeminent showcase for the exhibition of independent comics, graphic novels, and alternative political cartoons, is pleased to announce that the Philadelphia Free Library is the 2017 recipient of the Small Press Expo Graphic Novel Gift Program. 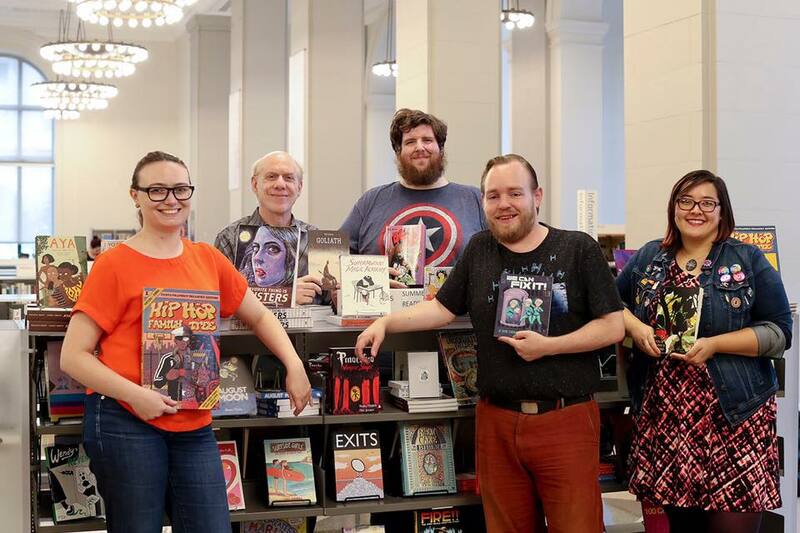 This program, the first of its kind in the United States, is an outright gift of graphic novels to the library as selected by the library’s collections specialists, who this year selected 87 titles comprising 310 individual books. 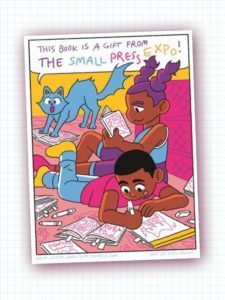 To date, the Small Press Expo Graphic Novel Gift Program has given away over 1800 graphic novels and comics to library systems from Virginia to Pennsylvania. 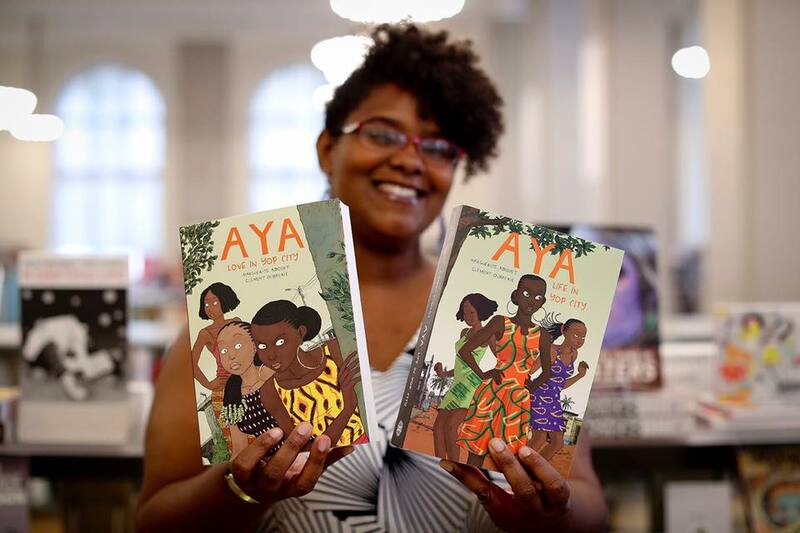 There was a formal presentation of the books to the Philadelphia Free Library by Small Press Expo Graphic Novel Gift Program Director Catherine Fraas on Saturday, September 9. Just a squad of some SPX comics wielding heroes: (left to right) Graphic Novel Gift program coordinator, Catherine Fraas; SPX Executive Director Warren Bernard, Directors of Fun, Joe Mochove and Rusty Rowley, and Registration / Volunteer Coordinator, Bailey Kung. The books were selected by the library’s collection staff from the offerings of publishers Fantagraphics, Top Shelf, Drawn & Quarterly, Cartoon Books, Adhouse Books and Koyama Press, all of whom support this program. The artist Kris Mukai designed a special bookplate that has been placed in all of the books to be donated by SPX. SPX’s Graphic Novel Gift Program is an expansion of the philanthropic and charitable endeavors that are part of its corporate charter, and is in addition to SPX’s annual support to the Comic Book Legal Defense Fund. The targets of this program are public and academic library systems in the Washington, D.C. Metropolitan area as selected by the Small Press Expo. – to provide library systems with additional resources by which they can purchase graphic novels and comics. SPX will be held Saturday, September 16 from 11am-7pm and Sunday, September 17, 12-6pm at the North Bethesda Marriott Convention Center in North Bethesda, Maryland. Admission is $15 for Saturday, $10 for Sunday, and $20 for both days.